SHIRTLIFTER 1 – 4: Non Ipad Ebook Versions now available. For those of you who have been asking, Northwest Press has made its entire digital catalogue available through gumroad.com. This means that Kindle/Android/Nook users have a non-Apple way of purchasing electronic versions of SHIRTLIFTER. For iPad ready versions of all three books, click here. We’re working on 4 and it should be available for download shortly.SHIRTLIFTER 4 ebook is now available too. 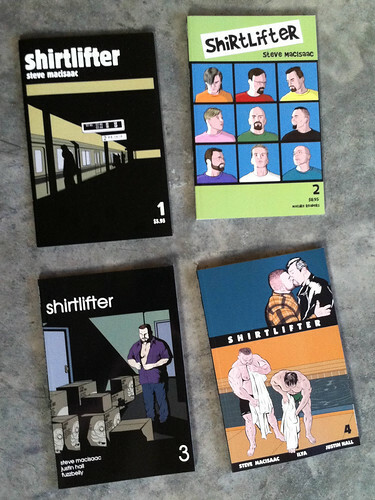 This has been out for a couple months, but I am just getting around to blogging about it now (2012 has been like that): The ebook version of SHIRTLIFTER #3 is now available. I took advantage of the fact that ebooks have no page restrictions to revise the layout, inserting some previously deleted panels and expanding others that had been cropped to fit the page. Consider this the “Extended Dance Remix Version”, 119 pages instead of 92. If you download it, or if you have read the paper version, please click on the above link and rate the book for iTunes. We live in the age of mediated consumer confidence.